Modifying description of multiple AD groups via powershell. I am Purti Bajaj , and i need one script which update my description for multiple groups in active directory. I am importing csv file but even though i m getting "object not found error". Below are the sample of script which i m using. Kindly look into this and do the needful. You're using single quotes around the group name and description; this tells PS to not expand variables inside the string. You need to use double quotes instead. And please use [code]/code] tags (see the toolbar above the input field) when posting code. Even i m using double quote too, its not working. And since you're working in IT, you should know that "its not working" is not a kind of error description that can be used to start beginning troubleshoot. The "object not found error" that you are getting might be because, as the command stands, you need to use Per-Windows 2000 group name. 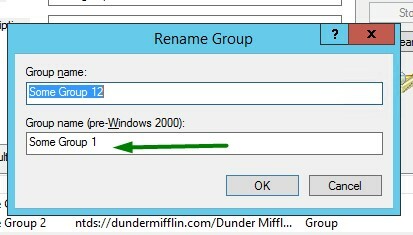 In this example I have to use "Some Group 1" and not "Some Group 12"
Then your CSV has no header line, or the columns are named differently than "GroupName" and "Description". The initial error was definitely that Set-ADGroup was searching for the literal string [b]$($line.Groupname)[/b]. The second error can only result from an incorrect csv.